Trajan expanded the borders of the Roman Empire to its greatest extent and was hoping his adopted successor, Hadrian, would continue to conquer even more territory. Hadrian was an experienced soldier, having campaigned with Trajan against the Parthians as a legate in early 117. History doesn’t describe Hadrian as having done anything outstanding during the campaign, however, Trajan did appoint him as governor of Syria when the current governor had to vacate to deal with problems in Dacia. During this time, Trajan was of ill health and getting worse, so he returned to Rome and left Hadrian in the East to keep matters under control. 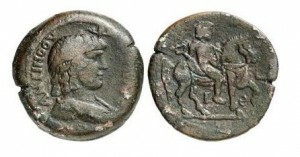 This is a great category in Roman Coins. After Trajan died on August 8, 117, Hadrian was endorsed by the Senate on August 9 as the next Roman emperor. Although now emperor, Hadrian was not able to travel to Rome to begin ruling the empire. First, he needed to attend to the Jewish revolt that broke out toward the end of Trajan’s reign and then had to get the Danubian region back in line. In Hadrian’s absence, his former guardian, Attianus, managed Rome until Hadrian could arrive. Hadrian finished dealing with the conflicts in the East, meanwhile surrendering the progress Trajan made in Mesopotamia and Armenia by negotiating peace in those regions. Although the extent of Roman territory pulled back a little at the beginning of Hadrian’s reign, he in turn fortified the borders to make the empire more defensible and affordable. 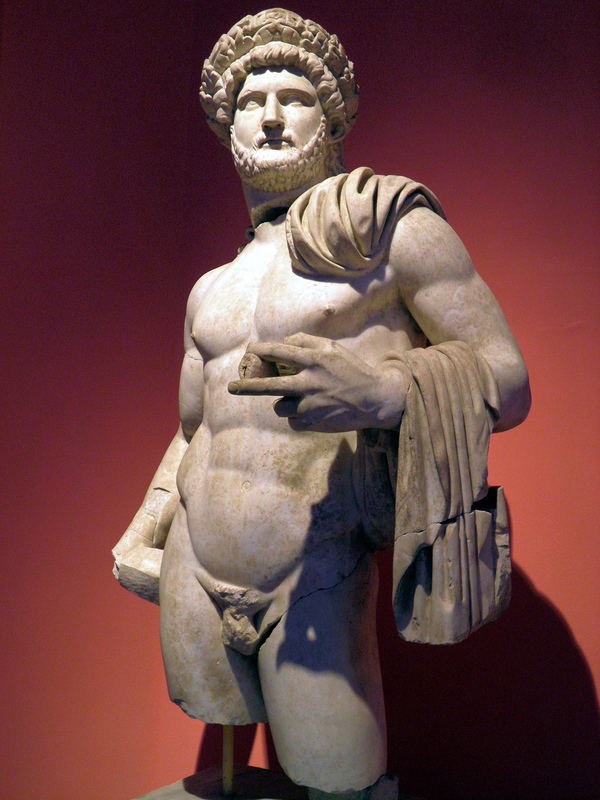 Hadrian and the Senate were at odds to an extent throughout his entire reign, as he way of thinking and lifestyle much more “Greek” than Roman tradition would have preferred for an emperor. However, there were never open hostilities between Hadrian and the Senate, especially since Hadrian’s way of managing the empire was a very hands-on approach, taking him out of the city for most of his reign. He instructed huge temples and other architectural wonders to be built around the empire, but especially in Athens. He was an avid hunter and the city of Hadrianothera in Mysia was built on the site where he killed a she-bear. Although he was married to Sabina, it was Antinous, his young male companion, who received the love and attention. Hadrian traveled throughout the empire, accompanied by Antinous, the travels which are grouped into two tours. The first tour lasted from 119-126. During this time is when Hadrian was working to reinforce the borders. He began in the Danube and Rhine regions and the building of forts, outposts and watchtowers, then moving to Britannia and erecting Hadrian’s Wall. From there, he visited Spain – his ancestral homeland and a source for much of the empire’s silver. After Spain, he headed east to Antioch and all of the surrounding provinces, finally finishing in Greece and spending time in Athens learning the Eleusinian mysteries. He returned to Rome in 126, having visited the provinces of Gaul, Germania, Britannia, Hispania, Cappadocia, Pontus, Galatia, Bithinia, Mauretania, Asia and Achaea. During his stay in Rome in 126-127, Hadrian saw the completion of the rebuilding of the Pantheon and his nearby villa at the Sabine Hills. In March of 127, he left Rome, visiting all over Italy to inspect the troops. He fell ill, but recovered and in Spring of 128 he left briefly for Africa. He returned to Rome in Summer, but then left for his second tour, which lasted from 128-132. During the tour through Egypt in October 130, Hadrian’s beloved Antinous drowned in the Nile River. Hadrian had Antinous deified, founded Antinoopolis in Egypt, and began a cult in his name, which went on to become very popular in Greek areas. Although there are coins referring to the safety and travels of the emperor during the first tour, this second tour is represented on a spectacular series of coinage in base metal, silver and gold. The reverses show the emperor restoring the province (Restitvtori series), visiting the province (Adventvi series), the personification of the province alone (names of the provinces series), or addressing the regional military (Exerciti series). This tour included Africa, Greece, Asia Minor, Judaea, Syria, Egypt and Cyrene. By 134, Hadrian was back in Rome and would stay there until his death on July 10, 138 AD at Baiae (modern-day Baia on the Gulf of Naples). 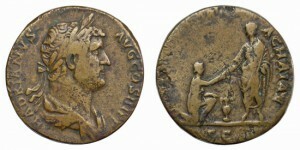 Shortly before his death, he adopted Antoninus Pius as his successor. Pius having promised to in turn adopt Marcus Aurelius, his grandson, along with Lucius Verus, the son of Aelius Caesar, whom Hadrian had initially planned to succeed him, but died on January 1, 138. Hadrian AE Sestertius, ADVENTVI IVDAEA, VERY RARE, 134 – 138 C.E. Hadrian Travel Series Denarius. Asia.